Opposition leader criticizes Netanyahu's Congress speech, says he should concentrate on security problems in Israel. 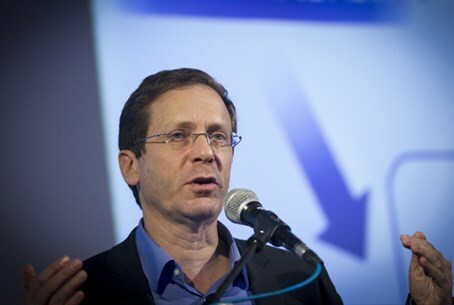 Opposition leader MK Yitzhak Herzog was unimpressed by Prime Minister Binyamin Netanyahu’s speech before Congress, claiming on Tuesday evening that Israel has been left isolated, even after the speech. Speaking at Moshav Nir Moshe in southern Israel, Herzog noted the significance of his being in the Negev instead of in Washington. "As you know, I could have been somewhere else this evening. But it was important for me to be here. I'd rather be in the Negev than in Washington because the security problems in the Gaza Envelope, Kiryat Shmona, Manara, Zarit and Jerusalem concern me no less than the threat of a nuclear Iran, which I do not underestimate," he said. "No Israeli leader would tolerate a nuclear Iran. The determination to prevent Iranian attainment of nuclear weapons crosses continents and cross parties," he continued. Herzog underscored the fundamental problem with Netanyahu's speech to Congress today, saying, "The question is not if the developing agreement is bad. The question is how to prevent a bad agreement. The painful truth is that after the applause, Netanyahu remains alone. Israel is left isolated. And the negotiations with Iran will continue without any Israeli involvement." He affirmed the critical importance of Israel's strategic alliance with the United States, and said, "As prime minister, I will know how to return the intimate and strategic dialogue with the U.S. I will know how to repair our relations with President Obama who is a close friend of Israel's. Only in cooperation with the U.S. and the White House is it possible to stop a nuclear Iran." Responding to Herzog’s criticism, the Likud party accused the Zionist Camp chairman of criticizing Netanyahu simply to receive a few more votes in the March 17 election. "Buji and the left once again proved tonight that Israel's security is less important to them than personal political considerations. As Prime Minister Binyamin Netanyahu is making great efforts to stop nuclear proliferation in Iran and its support for terrorism that threatens Israeli citizens, Buji chooses to attack the Prime Minister in order to gather a few more votes," said the Likud. "Israeli citizens who watched the speech know the truth: the Prime Minister and Israel's position had tremendous support in Congress, both by Democrats and Republicans, and received tremendous support among the American people. About 90 percent of the members of both houses of Congress attended the speech," the party continued. "When the Prime Minister courageously stood and said he would not remain silent in the face of the danger of extinction, he did so in the interests of national survival and the security of all Israeli citizens," stressed the Likud. On Monday, a day before Netanyahu’s speech, Interior Minister Gilad Erdan blasted Herzog over his continued criticism of the Prime Minister. "Is that so, Buji? Anything goes because we are in an election period? Even sabotaging public diplomacy and, in practice, sabotaging all of us, all the citizens of Israel? Too bad you and your partner (Tzipi Livni -ed.) are not able to rise for a moment above the narrow political considerations and are choosing to back the dangerous agreement with Iran, instead of standing alongside the Prime Minister,” Erdan continued.